Rixos Almaty Is situated right in the heart of Almaty within easy access to most business related institutions and next to a small yet a quite enough park. 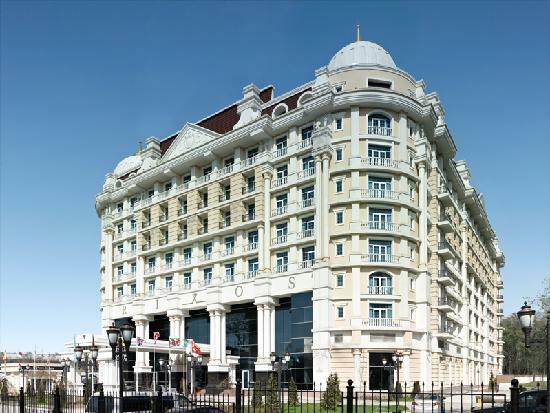 It is one of the luxurious hotels in Almaty. But let's not talk about business or luxury. Let's talk about what you can see without being dependant on a chauffeur or an assistant. When your are on a business trip it is not always easy to see the places that you would like to see. Right? First - you don't know what is around, second - you get taken everywhere you have to go, third - time is not in your side. But hey you are right in the historic center of Almaty. You have St. Nicolas Cathedral which is 5 minutes walk (if not less, depends on your speed ;)). Come out of the main entrance and head towards Kabanbai Street. Then turn right and keep walking until you to a T-junction. Now you should see a cinema theatre in front of you, called "Целинный" (Tselinny). If you keep walking on the right side of the theatre building you'll find yourself between a flea market to your right and the Cathedral to your left. By the way try not to walk by yourself in these narrow paths if you are not into adventures. Just be careful when you are a foreighner in any country. Not into cathedrals and stuff? How about an opera or a ballet? Yes! OK. When go up to Kabanbai Street take a left turn and keep walking until you hit to the fourth traffic lights and it will be a T- junction too. You would have walked for around 15 minutes by now (depends how fast you walk, doesn't it). Anyway, to your left you'll see Hotel "Almaty" and now it's time to take a look to your right and voila - Abai State Opera and Ballet Theatre. You might want a coffee and a little chat with your expat friends/business mates? You could do so if you kept walking passed the fifth traffic lights up to the little street further on. To your left you would have Coffeemania, a popular place among tourists and locals. Like a good run in the morning, go to Dinamo Stadium across the side entrance of Rixos or ask the staff. It's only two minutes walk. Other pluses: free parking, 1100 sq m ball room. Oh! And a park, which is behind the hotel.